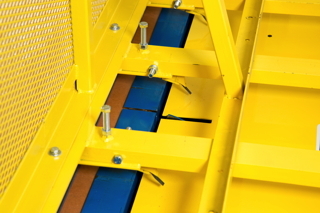 The Desheeter utilizes a simple right-angle transfer head to push the product off the conveyor and onto an adjacent perpendicular or parallel conveyor. Our desheeter utilizes a sheet clamp to capture the waste sheet while the load is pushed onto the perpendicular conveyor, past the waste sheet. The waste sheet is then ejected out of the rear of the device for collection. It’s a simple, quick and durable way to remove a waste sheet. 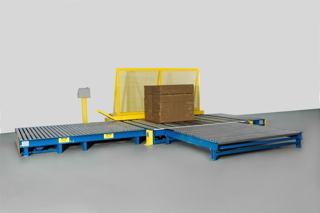 Reduces cycle time needed to remove the waste sheet using other means such as forklifts and manual removal. 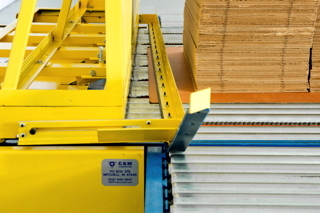 Automatically removes the waste sheet from the unit for customer orders that do not require a waste sheet. Drive: 1 HP totally enclosed industrial-rated 1750 RPM motor mounted to an in-line reducer for the speed reduction as specified. Drive motor with in-line reducer is grease filled and maintenance-free for a two-year period. Drive package is located within and under the device. Rotary limit switch with #40 chain and sprocket connection to the drive shaft provide adjustable forward and rear head positions. Preassembly: Unit is wired and (when applicable) plumbed to a junction box at the factory. Roller brake is mounted and plumbed (when applicable) at the factory. Conveyor height: 12 inch TOR minimum with leg and device extensions available for other heights. Voltage: System voltage is 230/460 volt, 3 phase, 60 hertz with 115 volt, single-phase control voltage. Waste sheet sizes: 4 to 11 inches beyond load is acceptable.